Similar to a checkbook’s check register. This feature shows all the money that has gone into and come out of the checking account. 1.To review an item, highlight it and then click “Review Detail”. 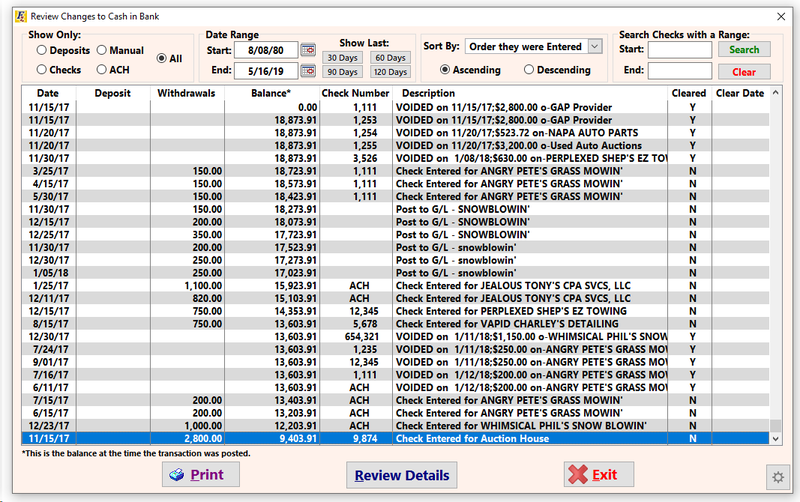 •If reviewing a check, a Check Review screen opens that shows basic information about the check itself. To see more information about the check, double click on the highlighted line that states the amount and date. The Enter Bill screen will again appear. •If we are reviewing a cost of a vehicle or an added cost, the vehicle screen or the added cost screen will appear. •If reviewing a deposit, the deposit screen appears. 2.Sort by checks only and by date using tabs 2 and 3. Note that the balance column in these screens will not be correct. In tab 2, this is because other transactions such as deposits are not included. In tab 3, the transactions are often taken out of order and therefore the balances are not accurate. 3. Click Print on the bottom left to print a listing of the information on this screen.